The original fortress built on this site by William the Conqueror was made of earth and timber. A few years later, he ordered that a stronger stone structure be built. The result was the White Tower, completed around 1100, which has stood as the centerpiece of the castle down the centuries. It has been modified from time-to-time including the addition of windows by Sir Christopher Wrenn but for the most part it remains a Norman keep. It may have been the scene for the most infamous episode in the Tower's history. In the late 15th century, Edward V became king. Because he was only 12, his uncle Richard, Duke of Gloucester was made regent. Richard ordered Edward and his younger brother to the Tower supposedly for their own safety. After arriving, the boys mysteriously disappeared and uncle made himself King Richard III. In 1674, the remains of two boys were discovered while re-modeling work was being done on the White Tower. King Charles II concluded that they were the missing princes and had them buried at Westminster Abbey. 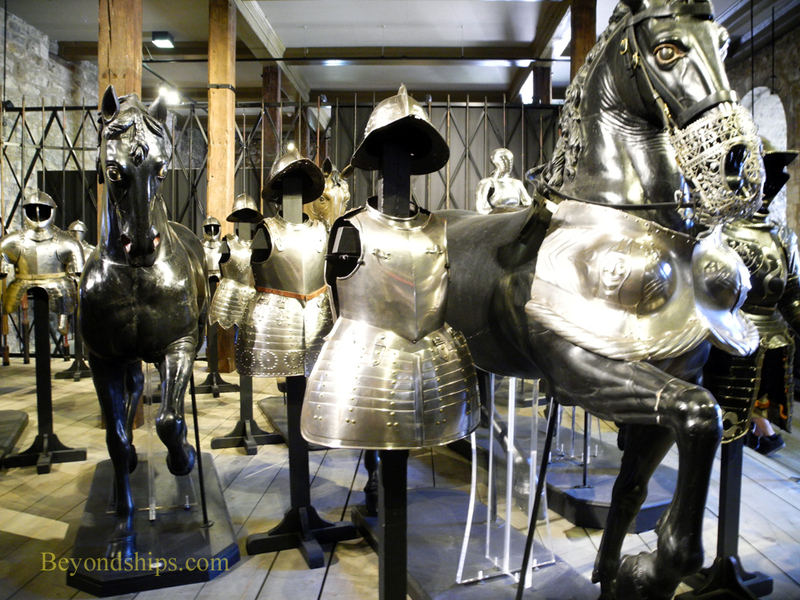 Today, the White Tower houses a massive collection of armor that includes armor worn by Henry VIII. In addition, there is a small Romanesque chapel. Visitors are free to explore the building on their own. However, there are also tours given by the wardens three times a day. 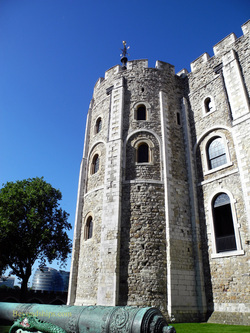 Above: The south front of the White Tower. Below: The armory inside the White Tower. Right: Sir Walter Raleigh was imprisoned here in the Bloody Tower and used that time to write his book "The History of the World." 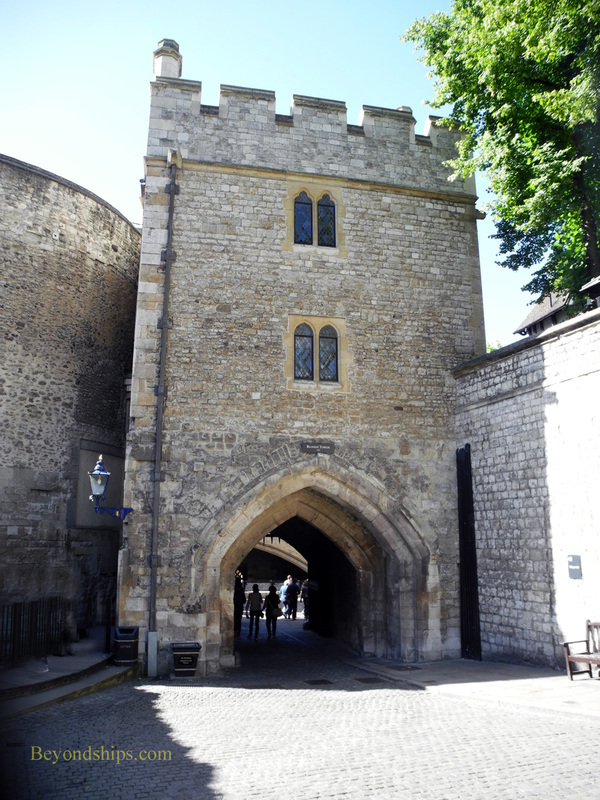 Straddling the road leading up to the White Tower and the interior grounds of the castle is the Bloody Tower. Built in 1220, it got its name because it was traditionally thought to be the site of the murder of the Little Princes (see the section on the White Tower above). 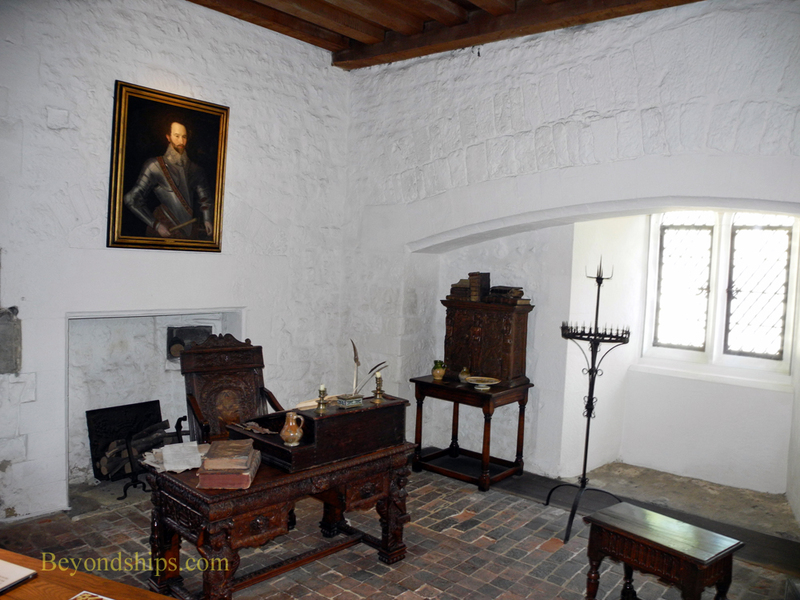 Today, some of the rooms in the Bloody Tower have been recreated to show how they would have looked when some of the Tower's more famous prisoners, such as Sir Walter Raleigh, were housed in the Bloody Tower. 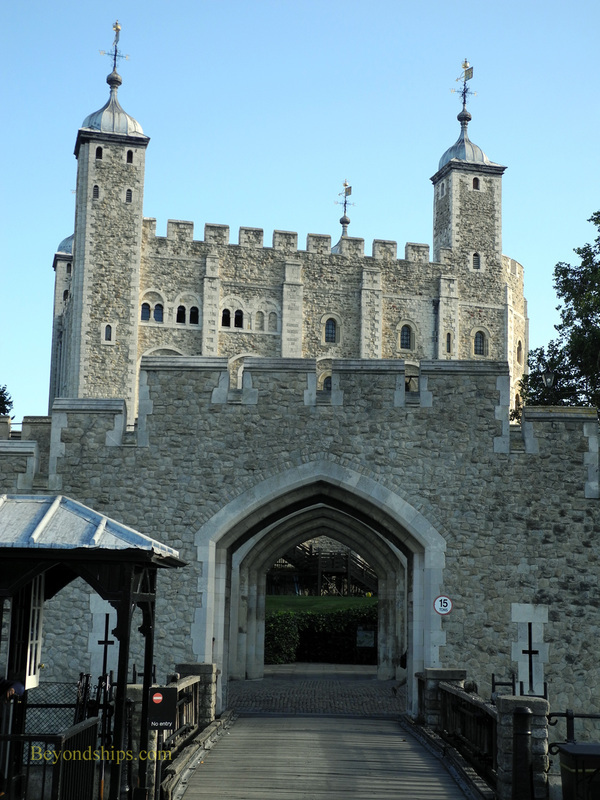 Tickets for the Tower can be purchased at the ticket kiosks on Tower Hill near the main entrance to the Tower. There are rates for adults, seniors, children and for groups. Because this is a very popular attraction, the lines to buy tickets can be quite long. Consequently, it is better to purchase tickets online before you arrive at the Tower. If you place your order more than 10 days in advance, the tickets will be mailed to you. If not, you have to pick them up at the Tower. Ticket in hand, you simply go through the ticket holders entrance. (See The Tower's official website). 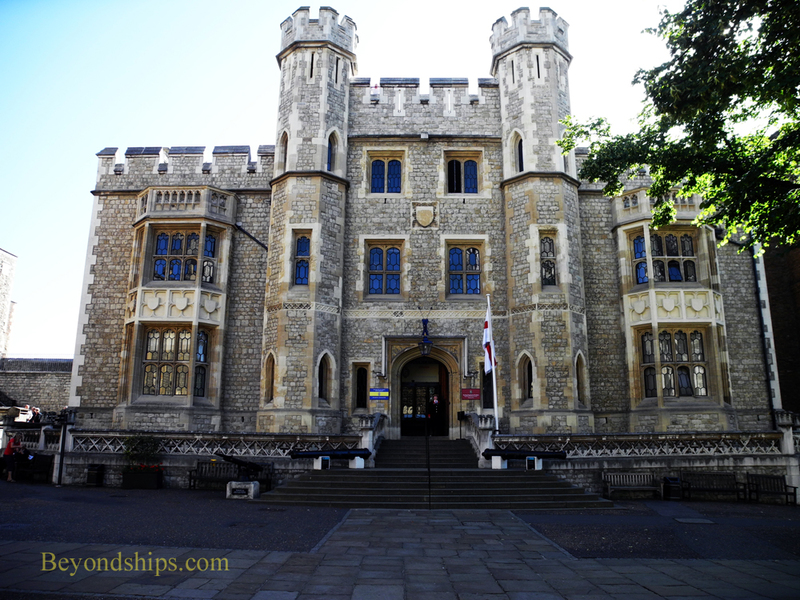 You can also enter the Tower using various combination passes such as London Pass that give you admission to several attractions for a single price. The Tower is very easy to get to. 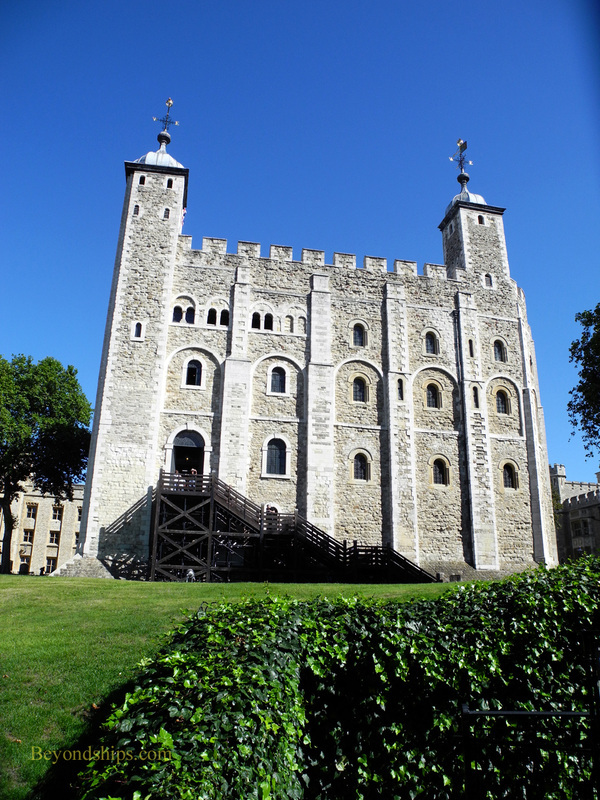 It is located on the north bank of the River Thames just east of the City of London (London's main financial district), Take the London Underground (Circle Line or District Line) to the Tower Hill Station and when you emerge you will be right at the Tower. It is also on the route of the various hop-on, hop-off buses that operate in London. Perhaps the most interesting way to get there is to take one of the boats that travel along the Thames between the Houses of Parliament and the Tower. Along the same lines, if you are a good walker, you can walk along the Thames to the Tower from the Houses of Parliament. Above: he former officer's quarters building houses the Royal Fusilier Museum. Formed in 1685, the Royal Regiment of Fusiliers was formed for the purpose of protecting the Tower's guns. This building still remains the regiment's official headquarters.